Ends are seen and endings are written”. Will you find this year’s Secret Venue? Proprietor of the Elegy Emporium and affiliated Olbituary Office, Doris Dodo stocks outstanding obituaries for her ill-fated birds. Run by the illusive Ms. Dodo and staffed by her collection of curious characters, visiting the office is always a memorable experience. 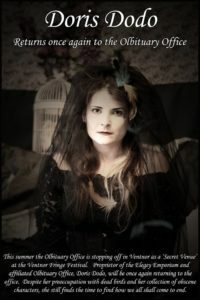 Jilted at the altar, Doris Dodo has channeled her unrequited love into a collection of deceased bir ds WHO WILL NEVER LEAVE HER. 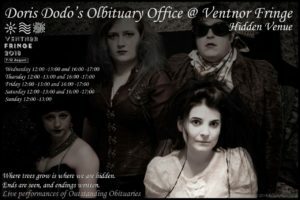 Your very own personal obituaries are written and performed live by Ms Dodo and her Elegy Emporium creatures, who are always very sorry (and eager) to deliver the sad news of your final conclusion. Doris’s nefarious niece, Lyssa, has secretly stowed away with the Olbituary Office with the help of her nervous and slightly unstable brother, Bundy. She has infiltrated the office, but can she remain hidden or will the curse of her past resurface and give her away? What has Lyssa done to evoke the wrath of Miss. Dodo? And will her disguise fool Doris? Psychoneurotic nephew and panicky apprentice of Doris, Bundy Applewhite was the page boy at her ill-fated wedding. He lives in eternal fear of Doris being disappointed in him, so please be kind to dear Bundy. With his loyalty torn between sibling and Mistress, will Bundy manage to keep Lyssa’s presence a secret? Will he ever please Doris? Probably not, but we will enjoy seeing him try. Marjory Stewart-Peahen was rescued from a life of servitude and mockery when Doris found her performing at a tacky, low rate travelling sideshow. Now a valued member of Ms Dodo’s far more classy travelling show, Marjory expresses herself through the medium of dance, however, be warned. Ms Peahen captures souls for Doris and places them in her many deceased birds. So keep your soul cards close to your chest! Guitar welding, cuban heeled, Mister Toots Wurlitzer, is one cool cat and if you manage to catch him at the Office, gee whiz, you are in for a treat. The Ventnor Darlings will be making an appearance at the Office with a piano, musical adequacy and a healthy amount of gin. They aren’t quite sure how they managed to be booked for the Elegy Emporium, but hey, a gigs a gig. Warning – due to high levels of deceased egg-laying vertebrates, characterised by feathers and forelimbs modified as wings and the general preoccupation with all things morbid, the Olbituary Office is not suitable for younger members of our community. The Emporium is open and ready to gift the details of your ultimate demise in the form of a handwritten poem on Wednesday, Thursday, Friday and Saturday between 12.00 – 13.00 and 16.00 – 17.00. Sunday will be the final morbid hurrah at 12.00 – 13.00.